The region of Bihar is one of the great foci of Indian history. From before the days of Buddha it was a major centre of Indian Political life and the most significant cultural centres, especially in respect of Buddhism.Hitherto the student of Ancient India has been rather badly provided with geographical and topographical studies. Dr. M.S. Pandey has made a very significance contribution to the subject. 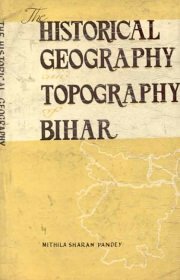 The author has ransacked a very large range of sources for information and has produced a survey of the subject which may in many respects serve as a model to students working on other regions of India.The chapter helps in understanding the geographical forces behind historical events of the state. The author has dealt very scholarly the Historical outlines; mountain systems; river systems, regions & districts, place-names, communications etc.The book is written with scholarly acumen and clarity and is very evidently the work of a man with a deep affection for his native land.